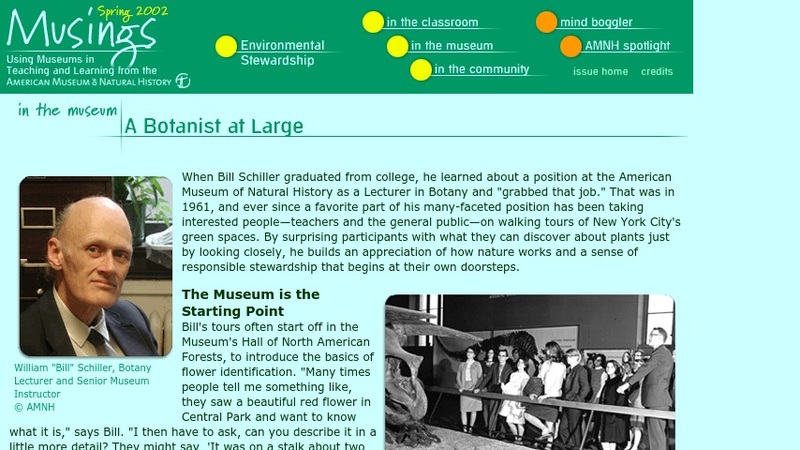 This online article, from the museum's Musings newsletter for educators, profiles two scientists who lead walking tours in New York City's green spaces. Bill Schiller, a botany lecturer and senior museum instructor, discusses the ways in which he "builds an appreciation of how nature works and a sense of responsible stewardship" during his tours. Bob DeCandido, an urban park ranger, explains how he "teaches city-dwellers to look closely at their wild neighbors and become better environmental stewards in the process." The article also includes ideas for four activities that can be completed during a walking tour.